The Narendra Modi-led NDA government is all set to showcase the progress of its 100 smart cities initiative to woo the urban middle class this election season. According to sources, the Centre would be talking about the work that has been done as well as the projects that are being planned in these 100 cities. During its campaigns, the party will explain how cities will get transformed over the next five years. Many of the brownfield projects are slated to start taking off after the polls. “The smart cities initiative is primarily aimed at the aspirational middle class. They want things like connected living, smart traffic management and waste disposal systems, among other things. The government will showcase how, during their term, they started work on all these projects and in the next term they will ensure that the initiative gets completed,” said a source close to the government. The people behind the initiative are also bullish about the projects being rolled out on time. As the cities were selected in a phased manner, projects were allotted at different times. However, they are confident that if all the projects are given the expected five years, the initiative would be complete. “No cities had done command and control system, bicycle sharing system, smart water supply, floating solar plants and so many other things together. These are complex projects and take time. Companies need to be set up, manpower recruited, and then comes tendering. 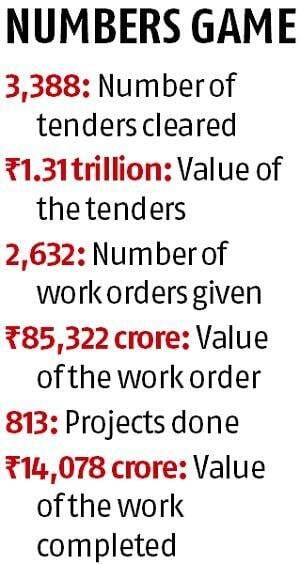 In limited time we have tendered over Rs 1.31 trillion worth of projects. So, we can clearly say that the projects have been given out swiftly and the process has been fast,” said Kunal Kumar, joint secretary and mission director (smart cities), ministry of housing and urban affairs. According to Kumar, they have tendered more than 62 per cent of the projects and work has been started in 42 per cent of those. In the 100 cities, 5,269 projects have been chalked out worth over Rs 2.15 trillion. Over the past three years, a host of international firms including companies such as Alibaba group, Japanese business conglomerate Hitachi, Finnish communications and information technology company Nokia, Twitter, Facebook have shown interest in the projects. Union Minister Hardeep Singh Puri recently said the government had spent six times the money used for urban rejuvenation in the 10-year UPA rule and asserted it was not going to stop at just 100 smart cities. “The amount spent on urban rejuvenation in the 10-year UPA rule, from 2004 to 2014… It’s around Rs 1.5 trillion. The money spent between June 2015 and February 2019 is six times that amount — Rs 8.6 trillion. That’s the difference in terms of scale and intensity,” he had said.